7 Reasons 5 Kids are Easier than 1. It never fails as I’m out and about with the 5 kids, I get the usual comments “Wow your hands are full”, “How do you do it?” ” My goodness you have 5 kids!” I’ve gotten so use to them they’re second nature. However, as I look back to the days when I only had 1 or 2 I realize how much easier my life is right now. I’m reminded on occasion when it’s just me and 1 or 2 of the kids. 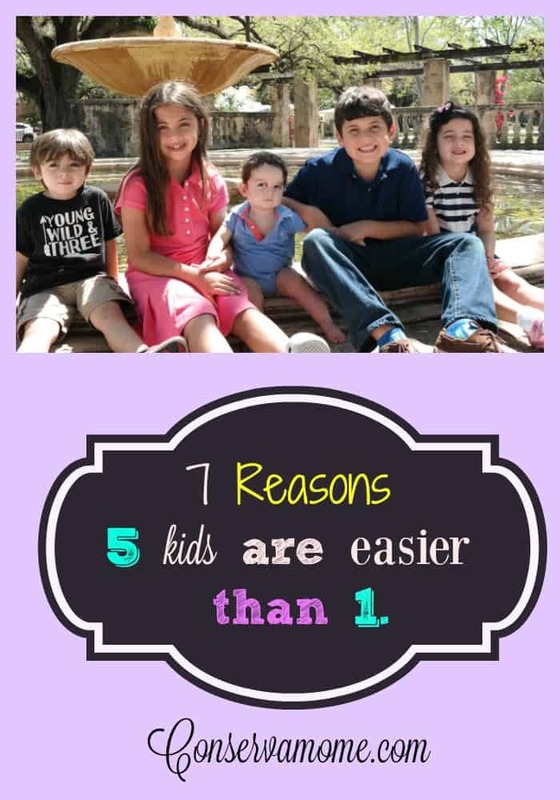 Granted we get out of the car easier when it’s just half of the group, but I’ve come to realize that more sometimes is better.So although there are a million reasons I could say why, here are the top 7 reasons why 5 kids are easier than 1. I’m raising the kids to be helpers. My kids are always taught to help. Many hands make the job lighter. That doesn’t mean I give them the responsibilities of an adult. There are days they are more willing to help than others,but overall they do make life easier. Each one of my kids has a strength we use to make life easier. My oldest loves helping my husband outdoors so keeping our property clean has become easier for hubby because my 9 year old LOVES to help. My 2nd oldest loves to be organized and is constantly keeping up with her sister who isn’t as organized. Kids will be kids and there are days they are not as much in the mood to help. That being said life is easier when you when you run out of toilet paper or need a diaper for the baby. We’ve never forced the kids to share ,because in essence that isn’t reality. However, when you have 5 kids someone always ends up sharing. Because they realize with 5 brothers and sisters around sharing is always a better option than not. Sure we’ll hear the phrase “I’m bored” uttered once in a blue moon but it’s usually in vain. These kids always find a way to have fun. Whether it’s playing outside or inside they always have a playmate. Having a baby can be sooooo hard. Especially when you’re trying to get the chores done around the house. Thankfully there are always 4 other willing hands to play with 5.0 and he loves it! Let’s face it hugs and snuggles are pretty delicious. All my kids have different temperaments , but there’s always one willing to satisfy my need for hugs and snuggles. My old neighbor always use to say her daughter loved coming to our house because of all the fun going on. It wasn’t so much that we were having a party but because with 5 kids there’s always excitement. Moving to a new city has shown me that, even though the kids miss their friends terribly having each other has helped not miss a beat. When my oldest was 3 I could barely get him to turn the tv on. My now 3 year old can work an ipad and put on netflix to his favorite show without help from anyone. The ironic thing is I never taught him any of those skills he just picked it up from his older siblings. That can be good and bad, but it teaches you that your little ones will pick things up from their older siblings even when they aren’t taught. Life with 5 can be hard. I’m not going to lie. Having more than one child (or any) may not be for everyone. There are days when there is too much chaos and screaming (because 5 voices are louder than 1 ). Sure, we may not be able to take that dream cruise I’ve been hoping to take for years, because 7 tickets aren’t in the budget. However, with the amount of love and fun we have in our home on a given day, I feel incredibly blessed having these 5 kids reminding me of the fun we’re having while doing this thing called life. Due to fertility problems, it looks like we will have an only child. However, we keep exploring adoption and fostering because my husband and I both would love a home full of kiddos! We started having kids late and I really wish we had tried so much earlier. When our daughter was born my husband said if he had known how much fun it is he would have wanted ten kids! On the other hand, our best friends have a toddler and just had twins! Talk about instant family! The babies are healthy now, and they know their lives will be crazy for a few years, but they’re going to have such a fun family! I couldn’t agree more. I just got the “you have your hands full” at the grocery store yesterday and I only had 3 of my 5. I think that with each child though you don’t remember what it was like when there were less. I was an only child and HATED every minute of it, so I truly enjoy the love, fun, and chaos that my 5 kids bring to my life. Love this!! I would love to have lots of kiddos!! Sadly I don’t think my hubby is in the same boat lol!! I loved this! We were a blended family with 5 children. There was 10 years between and youngest and the next to the youngest. I remember one day shopping in the baby store with all 4 children with us a woman said Well, I bet ya’ll have a a lot of fun in your house. And yes, we sure did. We had 4 of us growing up & I think my parents were completely overwhelmed by us lol I always wanted a big family of my own though! I had 3 younger brothers growing up and I loved it. We are still really good friends to this day and I’m 37 with the oldest boy being 9 years younger than me! I am an only child but my best friend had 6 siblings and I loved going to her house. It was always so fun and exciting. I’m the oldest of 9 and my mom always said this too! Once she got #4 it was easy. I learned how to change diapers at age 7 and loved helping with the babies! I have one son right now but I would love to have a large family! This is good to hear–I think there are struggles and joys with any number of kids that you have. We have five too! While 5 may not be easier than 1 (or even 2) for us, having all five is way easier then when we had 3 and 4! I have 3 (4.5, 2.5, and almost 10 months) and am looking forward to some.of these happening LOL! I have two kids but would of liked to had more.I think having more than one child is great because I came from a big family and loved having all my siblings to play with. These are some great points! I would love to have more, but I was am a bit overwhelmed with the two I have at the moment. ? I have three and it seems to be perfect for us. Everybody has the things they love but sharing happens naturally without force and the older brothers love to entertain the baby sister. The only problem I have is my 4 and 3 year old fight over who gets to help with dishes and cooking. I try to included everyone but my tiny kitchen only fits two but it’s not really a problem more of an inconvenience. We only have one child so far – a 7 month old son. He’s quite a handful so we’re nervous about adding another but have always wanted at least 2. This makes us feel a little bit better about eventually having another! I want 3 babies, so this makes me happy!! Wow 5 kids! I have two 14 months apart, and some days I feel like I’m losing it with 2 under 2. Then other days I can’t imagine not having them so close together. We plan on adding a third child next year! Nervous but hopeful! If you can swing five maybe 3 won’t be the death of me! ??? I have 5 kids and two of them are 14 mos. Apart. The older one of those two was a girl and thought her premie brother was a baby doll when I brought him home. So you too…. have your hands full. I had 2 and they were 10 years apart. That was good enough for me but KUDOS to you! I definitely had my hands full with three. I don’t know how you manage with 5! My hat is off to you! Thanks for sharing! I have only two, and my oldest and youngest are 9 years apart. It is a blessing that she’s able to help, but I find myself wishing she had a sibling closer to her age to play with. And then the two of them could’ve helped me around the house and with the baby! 😉 But, it is what it is. I’ve definitely experienced this with my 5 kids, too! When keeping up with all of the chores gets overwhelming, it’s an instant reminder that I’m not involving the kids in helping out as much as I should. It’s great for them to learn how to do things like laundry and dishes before they go into the world and realize that they don’t have any idea how to handle them.